Brandon Andrews, left, with his father Brian Andrews. 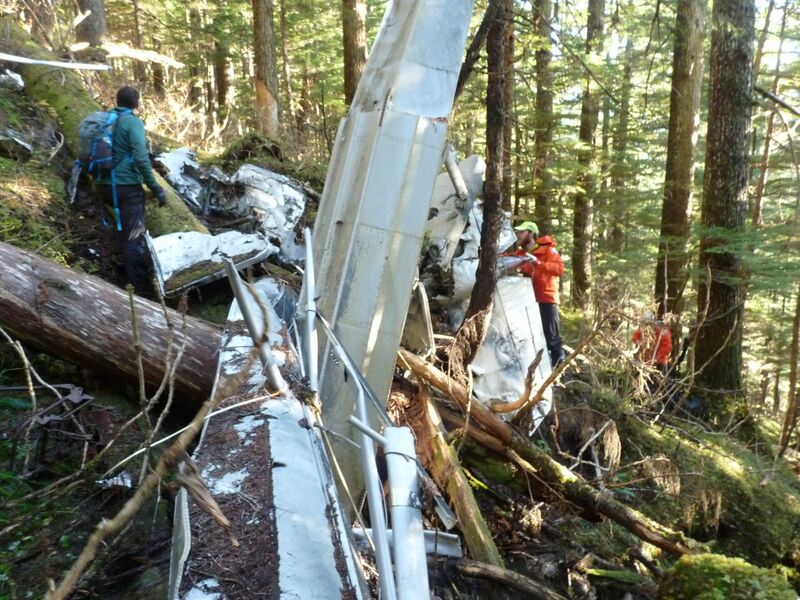 On August 9, 2008, about 1605 Alaska daylight time, a float-equipped Cessna 182E airplane, N9350X, impacted steep mountainous terrain after departure from Young Lake on Admiralty Island about 15 miles south of Juneau, Alaska. The private pilot and the pilot-rated passenger sustained fatal injuries. The airplane was destroyed. 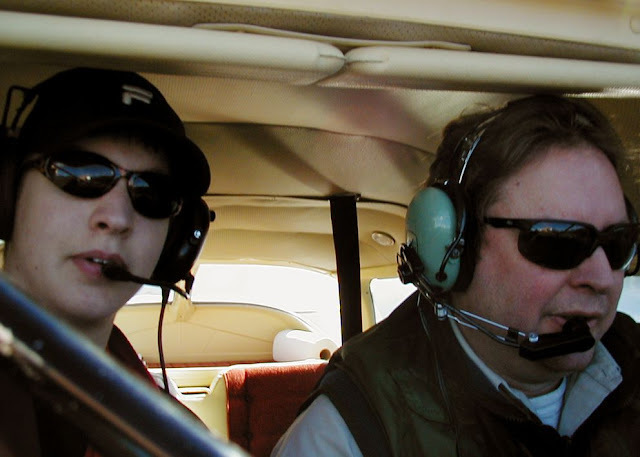 The airplane was registered to and operated by the pilot as a visual flight rules (VFR) personal flight under the provisions of Title 14 Code of Federal Regulations Part 91. Instrument meteorological conditions (IMC) were reported along the airplane's anticipated flight path, and no flight plan was filed. The airplane departed from the remote lake about 1600, and the intended destination was the Juneau International Airport Seaplane Base (PAJN) in Juneau. The pilot's youngest son reported that he, his older brother, and his father had been on a family camping trip at Young Lake, and, on the day of the accident, the group was returning to Juneau and determined that it would take two trips to transport all their camping gear. The pilot's son said that after discussing various options, they decided that all three would fly back to Juneau, one of them would stay behind in Juneau, and the other two would return to pick up the remaining camping gear. The son reported that they departed from Young Lake about 1515 and arrived in Juneau about 1540. He reported that when they left Young Lake, the weather was "open" on the north end of the lake but was "closed" on the south end of the lake. The youngest son remained in Juneau, and he reported that the airplane with his father and older brother on board departed from Juneau about 1540 with an anticipated return time of about 1630. The son reported that his father and brother were both experienced pilots and that his father was seated in the left seat when the airplane departed Juneau. He said that he was confident that his father was flying the airplane on the accident flight. After the airplane's 1540 departure from Juneau, there were no reports of communications with the airplane. No radar data were available for the flight. No emergency transmitter locator (ELT) signal was received from the airplane. An Alaska State Trooper reported that about 1915, the pilot's youngest son walked into the Federal Aviation Administration (FAA) Juneau Flight Service Station, to report that the airplane had not returned to Juneau and to inquire about any radio contact with the airplane. The airplane was officially declared overdue at 1932. The son said that he thought that the flight might have been delayed due to poor weather conditions around the Juneau area. Another Alaska State Trooper who participated in the search reported that a witness recalled seeing the airplane depart from Young Lake about 1600. The airplane's anticipated flight path from Young Lake in the Tongass National Forest to Juneau would have been on a north-northwest heading over about 16 miles of tree-covered steep mountainous island terrain, numerous ocean channels, and an extensive shoreline, containing small coves and bays. The area frequently has low ceilings and reduced visibility due to rain, fog, and mist. The U.S. Coast Guard, the U.S. Army Alaska National Guard, the Civil Air Patrol, the Alaska State Troopers, Juneau Mountain Rescue (JMR), and additional search volunteers conducted extensive air, water, and ground searches. 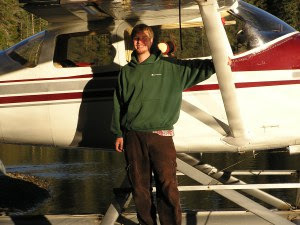 The youngest son reported that on August 9, 2008, Alaska State Troopers and JMR personnel reached the Young Lake area and found that the cabin the group had used was empty of gear, except for some trash. The son stated that this "probably meant that [his father and brother] felt they only had a small weather window and left." The official search was suspended by U.S. Coast Guard personnel on August 20, 2008. Family members and volunteers continued to search for the missing airplane. On October 25, 2017, the NTSB received notification from the Alaska State Troopers that the wreckage of the airplane was discovered on Admiralty Island by an individual who was hunting for blacktail deer. An examination of the airplane's maintenance records revealed no evidence of uncorrected mechanical discrepancies with the airframe, engine, and propeller. According to the maintenance records, an Aero Electronics Development Company, Inc., Pointer II ELT was installed in the airplane. On May 21, 2007, an annual inspection was conducted on the airframe, and the logbook entry stated, "inspected and tested ELT, replaced ELT battery, new due date is October 2008." On June 26, 2008, an annual inspection was conducted on the airframe, and the logbook entry stated, "inspected and tested ELT." An Automated Surface Observing System (ASOS) was located at PAJN, which was located about 13 miles north of the accident location at an elevation of about 25 ft mean sea level (msl). At 1553, PAJN reported a wind from 280° at 5 knots, prevailing visibility of 3 statute miles, light drizzle, mist, scattered clouds at 200 ft above ground level (agl), ceiling broken at 1,300 ft agl, overcast clouds at 2,000 ft agl, temperature of 12° Celsius (C) and a dew point temperature of 12°C, altimeter setting of 29.89 inches of mercury; remarks included: station with a precipitation discriminator, rain ended at 1533 and drizzle began at 1533, mountains obscured to the north through east through south and mountains partially obscured to the west, 0.02 inches of precipitation since 1453, temperature of 12.2°C and dew point temperature of 11.7°C. At 1629, PAJN reported a wind from 230° at 5 knots, prevailing visibility of 2.5 statute miles, light rain, mist, scattered clouds at 200 ft agl, ceiling broken at 1,300 ft agl, overcast clouds at 2,000 ft agl, temperature of 12°C and a dew point temperature of 12°C, altimeter setting of 29.90 inches of mercury; remarks included: station with a precipitation discriminator, tower visibility of 3 miles, drizzle ended at 1618 and rain began at 1618, mountains obscured in all quadrants, trace amount of precipitation since 1553. Refer to the Weather Study in the public docket for further weather information. On October 28, 2017, the National Transportation Safety Board (NTSB) investigator-in-charge (IIC), an aviation safety inspector from the FAA's Juneau Flight Standards District Office, an Alaska State Trooper, and members from JMR traveled to Young Lake via floatplane and hiked to the accident site. The wreckage was in densely-forested steep mountainous terrain about 1.25 miles northwest of the north end of Young Lake at an elevation of about 1,075 ft msl. The average tree height at the accident site was about 100 ft. At the wreckage location and in the immediate area surrounding the wreckage, various fallen and damaged trees were present; however, it could not be determined if these trees were damaged or fell due to the accident or natural causes. The heavily corroded wreckage was saturated with dirt, fungus, leaves, and branches. The cockpit and the fuselage were located on top of a small stream and were destroyed by a postimpact fire. Various mangled control cable assemblies were located throughout the cockpit and fuselage area. A small portion of the engine case was slightly visible above ground, and the rest of the engine and engine accessories were buried beneath the soil underneath the cockpit wreckage. The propeller was presumed to be buried beneath the engine. Both wings were heavily fractured and were torn from the fuselage and lying near the cockpit and fuselage. The empennage, which sustained thermal damage, was found lying next to the cockpit area. Both float pontoons were heavily fractured and were located on top of the cockpit area. Scattered throughout the accident site were various camping items. Due to extensive airframe fragmentation and thermal damage, flight control continuity could not be verified. The airplane's ELT was not identified in the wreckage. Due to the remote location, the wreckage was not recovered. The Alaska State Medical Examiner, Anchorage, Alaska, examined the skeletonized remains of the pilot and the passenger that were recovered. According to the medical examiner's autopsy reports, the causes of death for the pilot and the passenger were "most likely multiple blunt force injury." Toxicology tests on specimens from the pilot and passenger were not performed due to a lack of suitable samples. At the time of the pilot's most recent examination by an aviation medical examiner, the pilot reported having thrombophlebitis and using the blood thinner warfarin. Warfarin, also known by the trade name Coumadin, is not considered impairing. Flying weather in Alaska can be quite variable depending on the climate zone and time of year. Although all parts of Alaska experience periods of instrument meteorological conditions, such conditions are frequent in the Aleutian Islands, Alaska Peninsula, southeast Alaska, and the Arctic Coast during the summer and early fall. Weather conditions can change rapidly in Alaska, and the vast distances between some reporting points will often conceal significant local variations in the weather. VFR flight into IMC usually involves poor pilot decision making, whether in initiating the flight or continuing it into adverse weather. Weigmann and Goh (2000) list four factors associated with poor pilot decision-making in VFR into IMC accidents. The first factor is poor situation assessment. The pilot lacks experience in interpreting changing weather conditions, especially slowly changing weather. Tiredness, fatigue, and increased workload, or some combination of these, can also increase the likelihood of an inaccurate assessment of the weather. The second factor associated with poor pilot decision-making is faulty risk perception of the dangers involved in flying in marginal weather conditions. Recent research by Shappell et al. (2010) supports the notion that many pilots have a poor understanding and appreciation of the hazards associated with adverse weather conditions. Contributing to this perception, many pilots might have successfully navigated during marginal conditions in the past and so have gained confidence in their ability to succeed again in similar circumstances. The third factor associated with poor pilot decision-making is inappropriate motivations that bias the decision-making process. The term "get-home-itis" refers to the motivation of the pilot to complete the journey. The fourth factor associated with poor pilot decision-making is called "decision framing." Decision framing refers to the idea that a person's choice between a risky or safe course of action depends on whether the choice is framed in terms of a gain or a loss. When the safer course of action is framed in terms of a loss, the decision tends to be risk-seeking. When framed in terms of a gain, the decision tends to be risk-averse. In the case of VFR flight into IMC, research has shown that framing the decision to not fly into marginal weather conditions as a loss (i.e., wasted time, money, and effort) leads to a greater likelihood of continuing the flight, but framing the decision to not fly as a gain (i.e., it is safer) leads to a greater likelihood of diverting the flight (O'Hare & Smitheram, 1995). A fifth factor, one that is not discussed by Weigmann and Goh, is what is referred to as problem- solving set (Gick & Holyoak, 1979), which is the tendency to repeat a solution process that has been previously successful. In addition to altering one's perception of risk, successfully conducting a flight in marginal conditions by using a specific strategy (e.g., following a river while flying underneath the clouds) will increase the likelihood that the strategy will be used again under similar circumstances. Memory plays a crucial role in problem-solving, and repetition plays a crucial role in memory. So when faced with a problem (how do I make it through this weather? ), humans tend to adopt a strategy that has been used successfully in the past, even if the current situation does not quite match previous events. The previous NTSB case number associated with this accident when the airplane was missing was ANC08FAMS01. Brian Andrews and his son Brandon Andrews at a barbecue in 2006.